I spent two hours this morning writing a incredibly personal post about acceptance, friendship, growing old, our cat Percy and the fall of Rome and then there was an error message and it all went away. Eaten by the invisible internet monster that I haven’t lost work to in some time. I was crushed for about 15 minutes but then I realized the irony. Here I was struggling to think how I could rebuild a post about how dwelling in the past can keep us from greatness. So I’ll skip all that and get to the important part – how this relates to food. I made this breakfast in 20 minutes while lollygagging around the kitchen on Saturday. It’s thrown together using things we had in our kitchen and I probably wouldn’t even have posted this except that the simple sauce in this recipe is so good – I made extra toast so I’d have an excuse to eat it all. I thought that would be more lady like than just using a spoon. Step 1 Heat oven to 350. Take your 2 slices of French bread and sprinkle them with vegan cheese. Place them in the oven, cheese side up to bake. Check on them while you’re cooking your vegan bacon and tofu and turn off your oven once your vegan cheese melts. This will keep your toasted cheezy bread warm. Step 2 In your favorite cast iron skillet or fry pan that has a lid, heat 2-3 teaspoons of olive oil over a medium heat. Once your oil is hot, fry your vegan bacon until crispy. Remove from your skillet and place on a plate with a paper towel to soak up extra oil. Add another 1-2 teaspoons of oil and carefully place your strips of tofu in the hot oil. The moisture from your tofu is going to cause your hot oil to sputter back so watch your hands. Step 3 While your tofu is browning on one side, mix your Bragg’s, paprika and liquid smoke in a small bowl. Use a spoon to pour a little of your mix over each piece of Tofu. Try not to get too much in the hot oil. Once you can see your tofu has crispy edges, carefully flip your tofu on to the uncooked side and let brown. 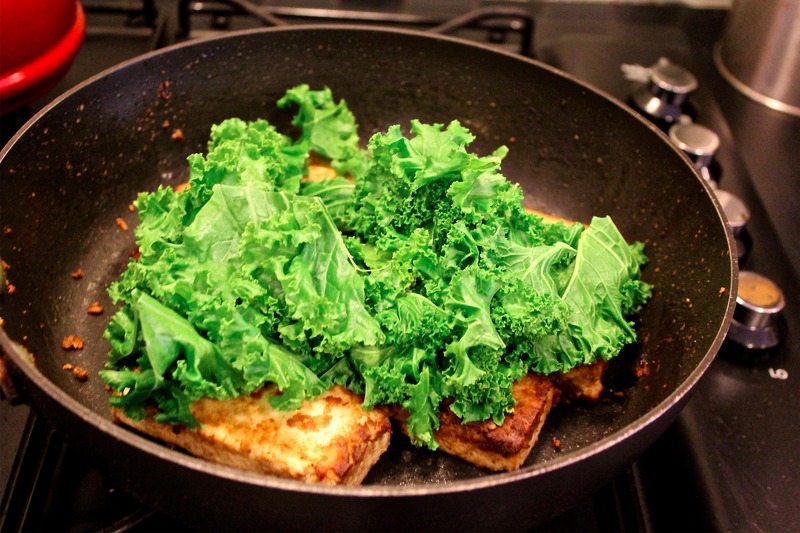 Step 4 Take your raw kale and place it on top of your cooking Tofu. You want to make sure your kale isn’t touching the oil. Here’s a picture below to illustrate. Step 5 Then cover your skillet and let cook for no more than 5 minutes. You just want your kale to be tender. Step 6 While your kale and tofu are cooking, whisk together your Hollandaise sauce ingredients in a small bowl until creamy. 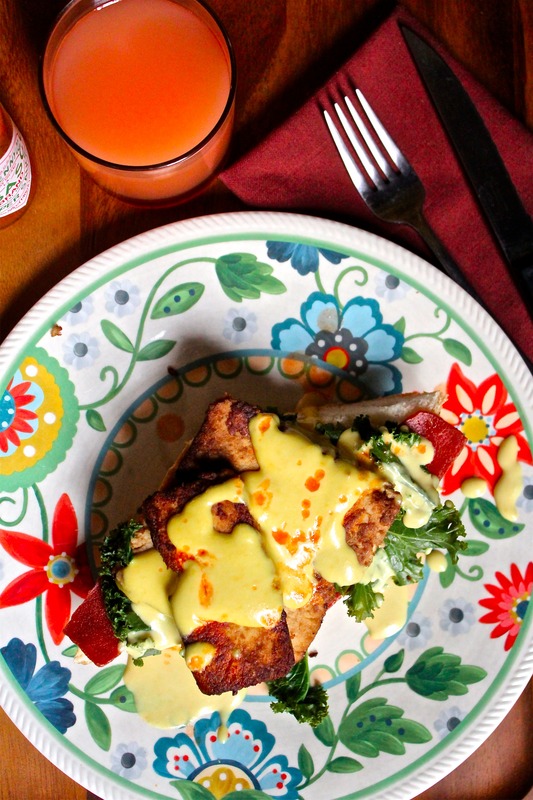 Step 7 To serve, top your cheezy toast with vegan bacon, then kale followed by tofu and topped with Hollandaise sauce. Toss a little Sriracha or hot sauce on top and enjoy!